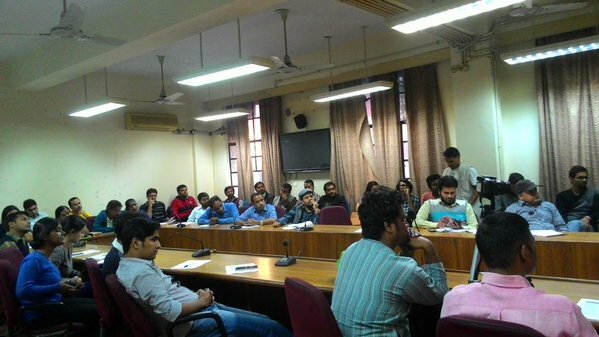 Terai Madhesh Study Group – JNU organized its first Madhes Manthan event “Political Crisis in Nepal and the question of Madhesh” at Jawaharlal Nehru University (JNU), New Delhi. We are really very much thankful to Prof. K M Chenoy (SIS, JNU) who happily agreed to chair the interaction programme. Prof. Chenoy also helped us in booking the committee room for the event. It was very enlightening to listen to Prof. S D Muni (Professor Emeritus, SIS, JNU) and Mr. Prashant Jha (Associate editor, Hindustan Times) in the interaction programme. His Excellency, ambassador Deep Upadhayay also graced the occasion and briefly addressed us. We are really very thankful to our distinguished speakers, the chair and his Excellency. Mr. Prashant Jha put Madhes issues into perspective. He shared his experiences from his recent visit to Madhes. He made it clear that until and unless Madhes issues are addressed, China Card and other tactics will not work. He was also very critical of Indian intellectuals who selectively criticize India but miserably fail to appreciate the people’s movement in Madhes and feel the agony of oppressed masses! Prof. Chenoy also echoed the same sentiments as Prof. Muni and Mr. Jha on Madhes uprising. At the same time, he criticized India for its diplomatic immaturity. His Excellency spoke briefly and was optimistic that situation will improve soon. He emphasized that both India and China are our neighbor but ties with India is very special. China, given the geography and culture, can never be as special as India. I had an opportunity to welcome our distinguished guest and participants. I also gave a brief powerpoint presentation before handing over to the chair. Mr Sohan Sha gave the vote of thanks. We are very grateful to Mr. Pramod Jaiswal, Sohan Sha, Raksha Jha, Aslam Hayat, Rajesh Singh who helped immensely in organizing the event. Our thanks are also due to other friends and participants for their encouraging presence. This event is the first in the series. We will do more such event in coming days. Formed a year back in Ganga Dhaba over a cup of tea, Terai Madhes Study Group, JNU is a group of Nepali- Madhesi students in JNU and Delhi. We have a facebook page to share study material and articles regarding Terai-Madhes- Nepal. We have frequent meetings in Ganga Dhaba, JNU. Bikash Mishra of JNU prepared and sent this report to us.